Wedding Season is in full swing here at World Digital Imaging, and we’ve begun to notice a trend. 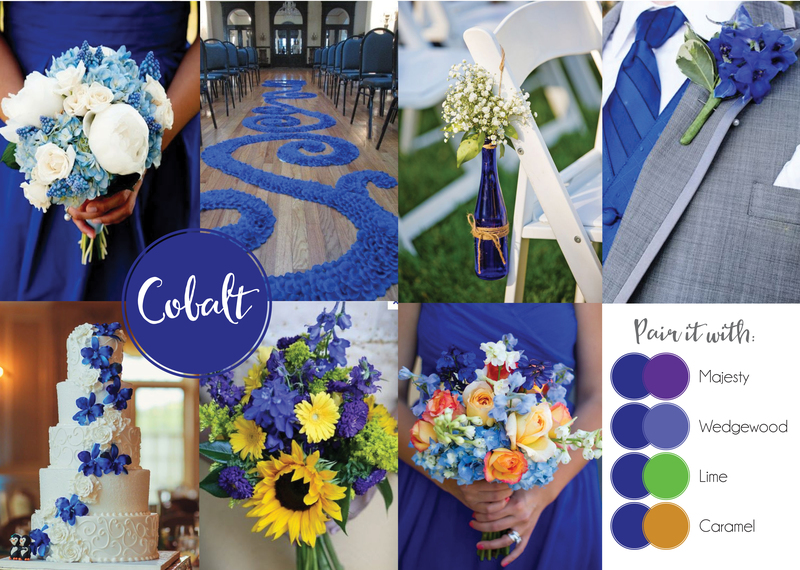 This year’s most popular color for weddings seems to be blue! 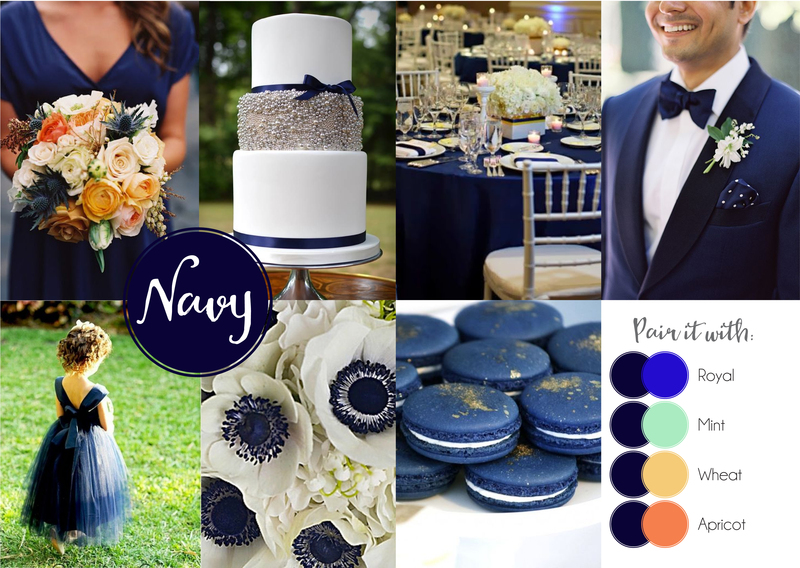 So since we’ve seen so many weddings using shades of blue, we figured we’d gather up some inspiration and create a few moodboards of our favorite blues for you! 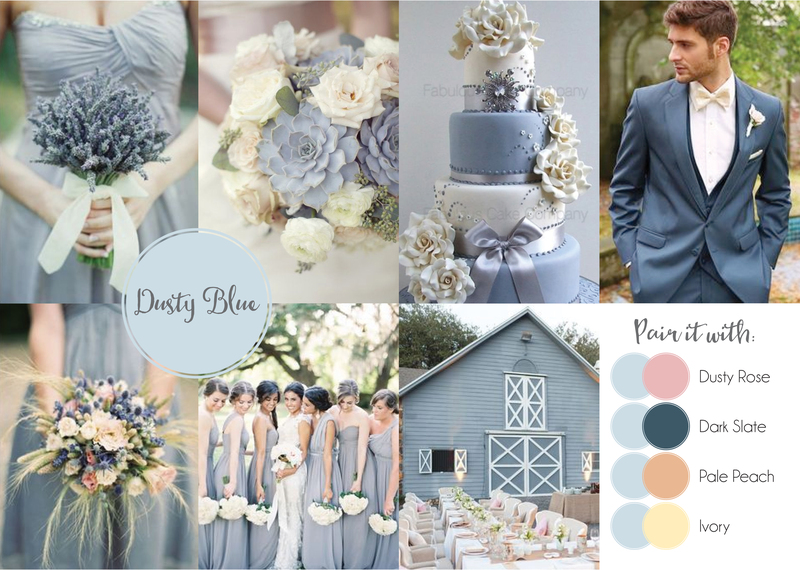 This pale gray-blue is super chic and great for everything from a formal church affair to a rustic barn wedding. It has a quiet beauty and paired with other muted tones like ivory or dusty rose, it creates a soft and romantic look that is perfect for spring and early summer. Another bonus is that these subdued shades tend to be flattering for most skin tones, so they’ll work great for your bridesmaid dresses! This color pairs well with other muted tones like dusty rose, pale peach, and ivory, but it also makes a statement alongside bold tones like a dark slate gray. You might also call this one sky blue or light blue, but no matter the name it’s sure to make a statement. It’s a fresh, natural color that brings to mind the soft blue of a coastal sky or the rustic blue of an old farmhouse. Soft and a little more understated than some of the other blues on this list, it works great with many other color combinations. We particularly love pairing it with a blush pink, lavender, a yellow-y neutral like porcelain, or a deep indigo. Another very popular color, especially for beach and destination brides. 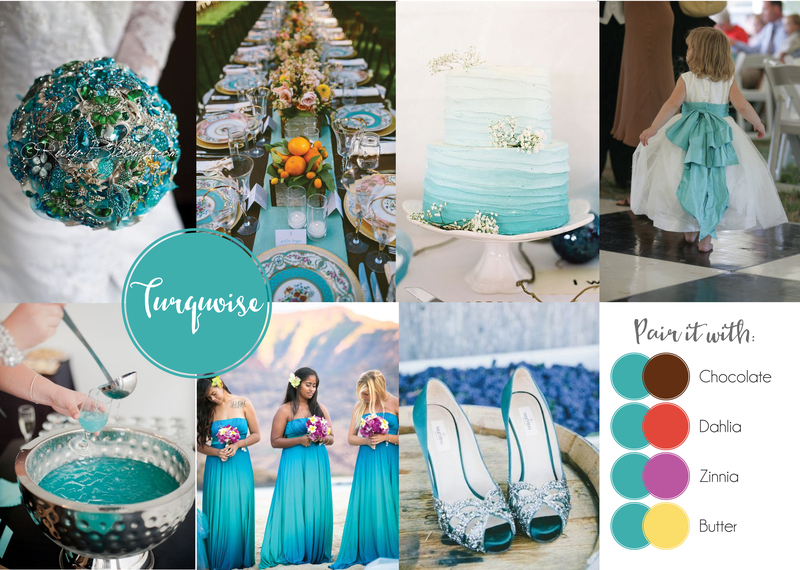 Turquoise and Tiffany Blue are super trendy this year and they pair well with bright florals such as pink dahlias, purple zinnias, or even bright purple orchids. We also love the idea of matching your punch to your colors! You can find the recipe for this cute turquoise punch on our Something Blue pinterest page! The deep blue-green is all the rage and certainly makes a statement! 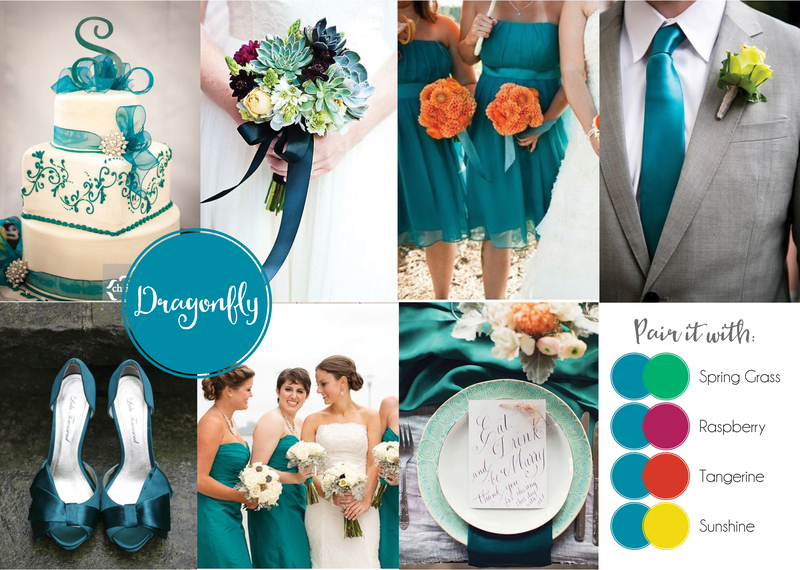 Teal is timeless It looks great paired with other jewel-tones like raspberry, tangerine, and bright sunshine yellow. The quintessential wedding blue. It’s bold and beautiful, and classic. It’s a strong and reliable shade, which is why it is such a classic wedding color. This versatile blue will work well for every style from formal and traditional to modern and offbeat. We love seeing it paired with other jewel tones like a deep majestic purple, rich golden caramel, or bright lime green. It also goes beautifully with other blue shades like a soft Wedgewood. Black, Gold, and Navy Beauty – from The French Confection Co. Deep, dark, and sophisticated. Navy is a great base color to pair with metallics like silver and gold, but it also works well on its own. You can go nautical and pair it with neutrals like khaki and white, or go bold and modern with bright accents in mint or apricot. And as always, colors within the same family will typically look great together, so combine rich navy with a bright royal or cobalt for a bold blue bonanza! What is your favorite shade of blue or color combination? Let us know in the comments! 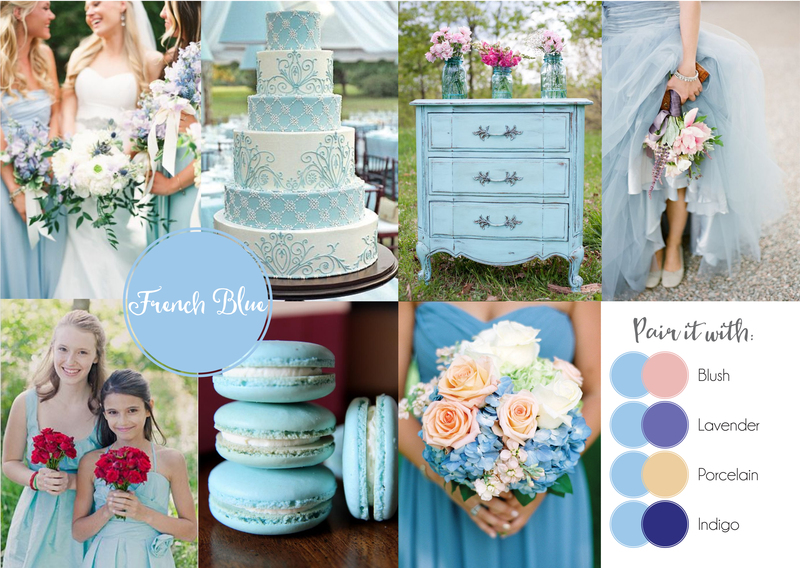 Don’t forget that you can also find all of these images as well as more awesome blue inspiration if you follow our Something Blue board on Pinterest! And keep an eye out for some great real wedding inspiration from one of our very blue brides coming soon!